According to a number of local sources, Hamas leaders have reportedly reached a deal with the Israeli government to prevent their fellow Palestinians from protesting at the border each week, in exchange for some concessions from Israel. As part of the deal, Israel will allow Hamas officials to receive money from Qatar to pay their salaries for the next six months. The draft agreement will apparently include an expansion of the fishing zone off the coast of Gaza from 6 to 14 nautical miles, the partial opening of the Rafah border crossing from Gaza to Egypt, and the partial lifting of the blockade that Israel has imposed on Gaza for the past eleven years. Ahmad Yousef, a senior political leader of Hamas, told the Maan News agency that the understandings including a serious of what he called “mutual measures between the parties,” following by another phase which includes a “comprehensive agreement” including prisoner swap, and establishing a Sea Port. Yousef said that the Egyptian-mediated understandings, would lead to a series of measure by Israel, including allowing vital economic projects in Gaza six months after implementing the deal. Part of the “understandings” on the Egyptian part, will include easing the restrictions on the Rafah Border Terminal, ahead of rehabilitating the crossing before permanently opening it. 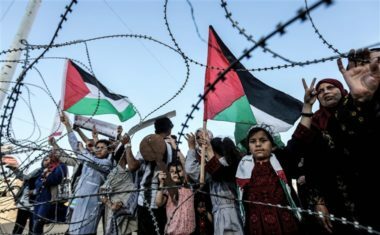 On his part, Talal Abu Tharifa, a member of the Political Bureau of the Democratic Front for the Liberation of Palestine (DFLP), said all factions in Gaza have agreed to maintain the peaceful nature of the protests, in return for opening the crossings and allowing fuel supplies into Gaza. He stated that what was reached is only “an understanding mediated by Egypt,” and not a comprehensive calm agreement. The ‘understanding’ is meant to ease the tension, but he added that a comprehensive deal must be achieved after full Palestinian national reconciliation. It added that any agreement between Hamas and Israel, without consulting with the Palestine Liberation Organization (PLO), is just one step towards passing the so-called “Deal of the Century” of U.S. President Donald Trump, without any real independence, especially since Trump has already excluded occupied Jerusalem from any peace agreement, and the efforts to fully separate the Gaza Strip from the West Bank. In related news, the official TV of Qatar has reported that the country will transfer 15.167.000 Riyals (Approximately $4 Million) to the Hamas-led government in Gaza to enable it to perform its duties, including paying salaries and providing essential services. It is worth mentioning that Israel said it does not appose the move, especially since Qatar contacted Tel Aviv with an urgent request in this regard.